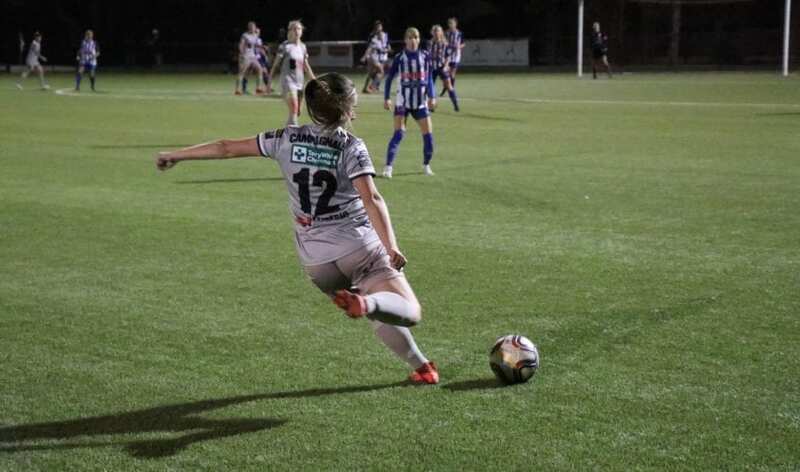 Adelaide City have suffered their first defeat of the season, going down 4-1 against a strong West Adelaide side in Round 6 of the WNPL at West Beach Parks Football Centre. Ultimately, City was unable to match against the extremely disciplined and clinical display put on by West Adelaide. This is also the first time the Black and Whites have lost to the Hellas in their past 15 meetings since the latter re-joined the WNPL level. West Adelaide gave off their first warning sign in the first minute, when eventual-goalscorer Mina Nishitani struck a long-range shot from the centre-half line to try and catch ‘keeper Kendall Jenner off guard. However, the latter had it under control by tipping the ball over the cross bar. Hellas took the lead at the eighth minute through a set-piece from Nishitani, when Jenner could not get a good hold on the free kick and it scrambled across the goal-line. City equalised just before the half-hour mark – Tiarn Powell came out on top after going solo against goalkeeper Sarah Willacy. She drew Willacy off her line, timed her shot well and sent the ball rolling into an open goal. The draw did not last long though, as West Adelaide scored five minutes later. A cross from the left flank found Georgia Macri unmarked with plenty of space at the far post, and she slotted the goal past the keeper. City’s best opportunity to level came through Daniela Di Bartolo in the 38th minute, when she tried to pull off the same goal as Powell. However, two West Adelaide defenders got back just in time to make the crucial goal-line save, and forced City to trail by a goal heading into the second half. City looked to have gained back more control of the game after heading back out from the sheds and dealt with the high pressure from West Adelaide better. Unfortunately, the opposition increased the goal margin by two in the 48th minute. City’s defence could not clear West Adelaide’s corner, and they were punished when Macri struck another goal into the back of the net. City had two consecutive chances in the 64th and 67th minute through Chelsie Dawber and Dylan Holmes respectively, however they could not get the ball past ‘keeper Willacy at all.